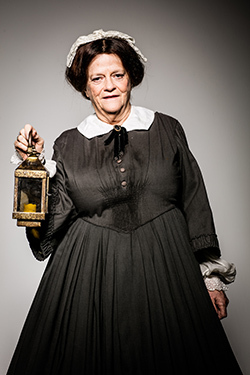 Former Conservative MP Ann Widdecombe has transformed herself into nurse icon Florence Nightingale to raise money for cancer research. Ms Widdecombe and other celebrities have been photographed dressed as their rebel heroes for Stand Up To Cancer, a joint fundraising campaign by Cancer Research UK and Channel 4. Launched in 2012, Stand Up To Cancer raises money to support UK cancer research. Ms Widdecombe, who has appeared on Strictly Come Dancing and describes herself as a rebellious spirit, said: ‘I chose Florence Nightingale as my favourite rebel for Stand Up To Cancer because if ever there was a rebel, it was she. There's never been a rebel quite like Florence. ‘If you think about what she did, she took a band of unmarried women to the Crimea in a war zone in the 19th century when young ladies didn't leave the house without a chaperone. Other celebrities who have dressed up for charity include comedian Alan Carr and Krishnan Guru-Murthy, presenter of Channel 4 News, who dressed up as Jimi Hendrix. The Stand Up to Cancer campaign will continue throughout September and October, and the public can get involved in a variety of fundraising activities.